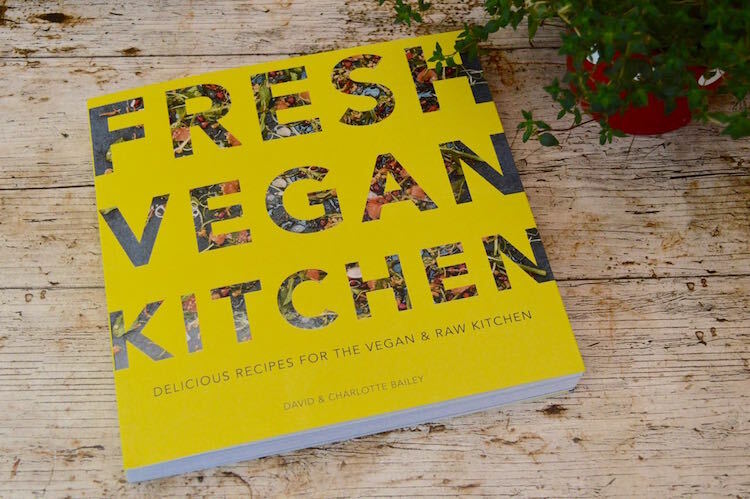 Fresh Vegan Kitchen: delicious recipes for the vegan & raw kitchen by the founders of Wholefood Heaven, David & Charlotte Bailey, is out in paperback this month. It contains over 100 interesting and tasty wholefood recipes from around the world, including raw and gluten-free ones. Some of them are familiar favourites and some I’ve never come across before. The book starts off with a couple of pages on the health benefits of raw food and some vegan cooking tips. The action kicks off quite quickly with a chapter on Breakfasts. I do love breakfast and if I had a life of leisure, it would be my favourite meal of the day. As it happens I’m usually dashing around too much to enjoy it. 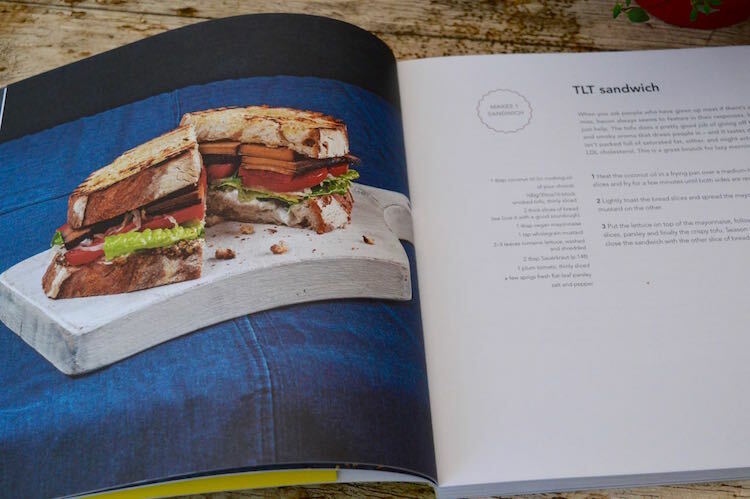 The very first recipe is this tofu lettuce tomato sandwich, which is more concisely named TLT sandwich in the book. This is followed by recipes for g’raw’nola (raw granola), black rice pudding, eggy bread and more. Other chapters are as follows: Soups, Small plates & street food, Salads, Curries & mains, Sides & dips, Desserts, Pickles, spreads & treats and Drinks & smoothies. David & Charlotte are keen to ensure that their recipes, whilst delicious, are also healthy. Even the sweet recipes are mostly ‘sugar free’. Borage and blueberry snow cones are made with rice syrup, raw chocolate brownies are made with dates and the silken tofu chocolate mousse with maple syrup. The sugar recipes do look good though: poached pears with vanilla cashew cream, peanut and black sesame sweet dumplings and churros with dark chocolate dipping sauce – sigh! If this tofu lettuce tomato sandwich recipe is anything to go by, we’re all in for a fabulous treat. The global nature of the recipes really appeals to me. I’m always keen to try vegetarian food from other cultures; they often have a long history of vegan or vegetarian eating and have much to teach us. I’m particularly keen to try making the gyoza dumplings with black vinegar dipping sauce, the ba0 zi steamed buns and Vietnamese summer rolls. As well as food from the Far East, there are plenty of Indian, Mexican and Middle Eastern dishes as well as a few from Europe such as farinata, arancini and caesar salad. The mix of cooked and raw recipes is a nice one. I’m rather wedded to my cooked food, but I do try and get something raw in each day and this book provides a few more ideas. Raw pad thai is calling to me with its Asian flavours and sweet and sour sauce, as is sunomono, a cool and crisp cucumber salad with seaweed. I was interested to note a recipe for raw borsht. I’d come up with something similar a couple of months ago when trying to use up the beets from my beet kvass. Great minds think alike, obviously! My main quibble with this book is that it’s in paperback. I can see this being a keeper, which means I shall have a hard time stopping it from falling apart. I do try and look after my books, but it’s hard to keep a well used cookbook in good condition at the best of times and softbacks can be a touch too fragile. There are a few ingredients that probably aren’t that easy to get hold of, such as probiotic powder to make coconut yogurt and raw nut cheese, but most are easily available. The secret to this most delicious tofu lettuce tomato sandwich is the smoked tofu. I’d never actually eaten smoked tofu before trying out this recipe. I say recipe, but it’s really an assembly job. Now I’m a convert. Fry it up and you have something that almost, dare I say it, resembles bacon. It’s also easy to buy now and is available in supermarkets as well as health food shops. As per usual, I didn’t quite follow the recipe as given below. I went a little lighter on the coconut oil and used a teaspoon rather than a tablespoon to fry the smoked tofu in. It produced a delicious crispy result despite the reduced amount. I went a little easier on the mayonnaise too. I also swapped the sauerkraut for some carrot pickles and kohlrabi pickles as that’s what I had to hand. But I reckon a good sauerkraut would be fantastic and I really ought to get back into making it again. The book gives a recipe for this, of course. So, I sandwiched the crispy smoked tofu in some crusty wholemeal bread along with mayonnaise, mustard, crunchy romaine lettuce, ripe tomatoes, carrot pickles and homegrown parsley. 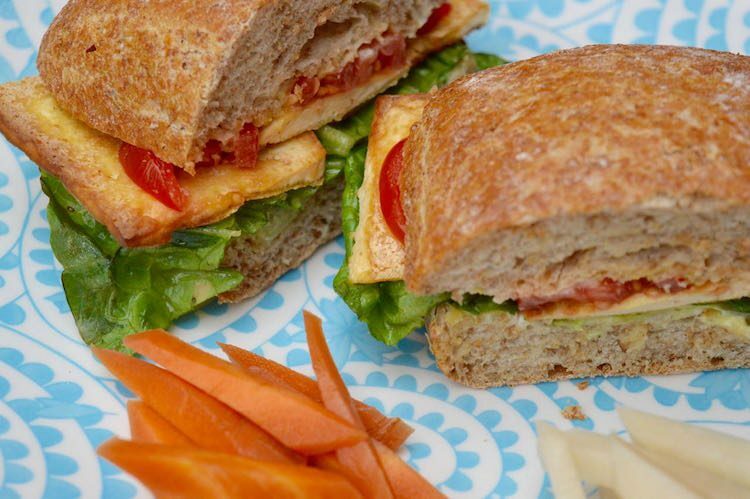 The authors describe this tofu lettuce tomato sandwich as a great brunch for lazy mornings. I made two large ones for lunch, one for CT and one for me and it was one of the best lunches we’d had in a while. 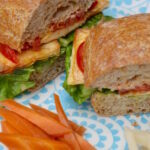 A delicious quick brunch or lunch vegan sandwich made with smoked tofu. Heat the coconut oil in a frying pan over medium-high heat. Add the tofu and fry for a few minutes on each side until crisp. Lightly toast the bread and spread the mayonnaise on one pice and the mustard on the other. Put the lettuce on top of the mayonnaise, followed by the sauerkraut, tomato parsley and finally the tofu. Season with salt and pepper to taste and close the sandwich with the other slice of bread. Slice in half and enjoy. Thanks for visiting Tin and Thyme. 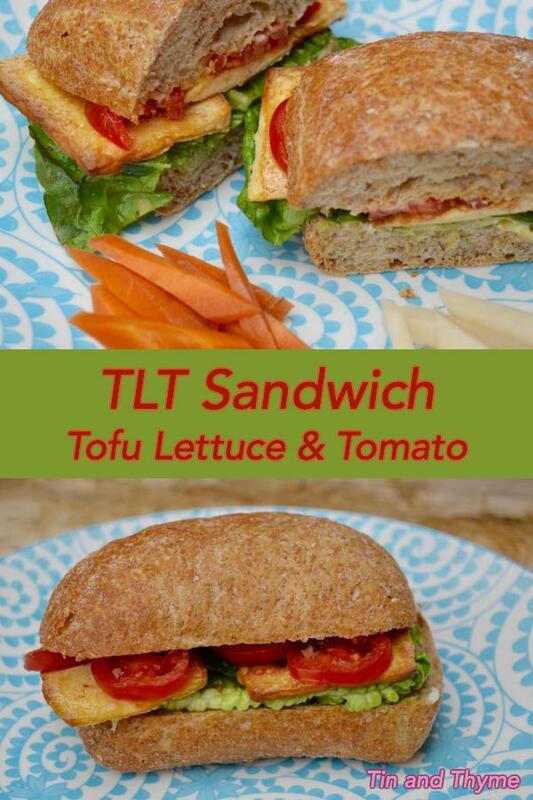 If you make this tofu lettuce tomato sandwich, I’d love to hear about it in the comments below or via social media. Do share photos on your preferred social media site and use the hashtag #tinandthyme, so I can spot them. For more delicious and nutritious recipes, follow me on Twitter, Facebook, Instagram or Pinterest. 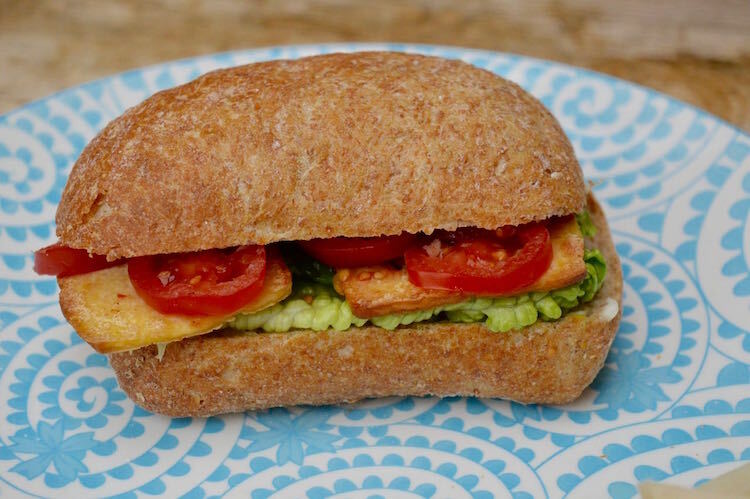 I’m sharing this tofu lettuce tomato sandwich with #CookBlogShare, hosted this week by Monica over at Everyday Healthy Recipes. Tofu Lettuce Tomato Sandwich. PIN IT. Pavilion Books is offering one Tin and Thyme reader a copy of Fresh Vegan Kitchen. To be in with a chance of winning, please fill in the Gleam widget below. You will need to leave a comment on this post, answering the question, which then gives you additional chances to enter if you so wish. Gleam will pick a winner at random from the entries received. If you are commenting anonymously, please give me some way of identifying you as I will be verifying the validity of entries. Any automated entries will be disqualified. This giveaway is only open to those with a UK postal address. Winners will need to respond within 5 days of being contacted. Failure to do this may result in another winner being picked. Prizes are offered and provided by Pavilion Books and Tin and Thyme accepts no responsibility for the acts or defaults of said third party. Tin and Thyme reserves the right to cancel or amend the giveaway and these terms and conditions without notice. I was sent a copy of Fresh Vegan Kitchen to review. I was not expected to write a positive review and all opinions are, as always, my own. Thanks to my readers for supporting the brands and organisations that help to keep Tin and Thyme blythe and blogging. I enjoy Winter Squash Lentil Stew because it is filling and warming during the colder months. You’re almost making me wish it was winter Tracy. Cashew nut stir fry is my favourite vegan recipe as it is super quick, nutritious and I can use whatever vegetables I have in the fridge. Sounds perfect. I’m all for dishes you can use whatever you have in the kitchen. Caponata, a delicious aubergine stew from Sicily, made with olives and capers – a really tasty bowl of the Mediterranean! Ooh, I don’t think I’ve tried caponata. It sounds delicious. wow I want this sandwich! Those tofu slices look so crisp and great. Smoked tofu is a revelation Angie. All you have to do, pretty much, is slice and fry. Chickpeas are brilliant for those sort of curries. Tasty too. Roasted aubergine because it’s easy to make and tastes really good. I’m a recent convert to aubergine, but now I love it. This looks delicious – I love this sort of sandwich esp if the tofu is really crispy. I buy smoked tofu occasionally – I think my favourite way I have used it is with a mustard and honey marinade. The tofu was really crispy. Seems to be much easier to achieve this with smoked rather than ordinary tofu. Your marinade suggestion sounds like I need to try it. Hahaha, sounds like you need this book. Good luck. Ooh, that sounds delicious. I do love a good curry, but have never tried that combination. Butternut squash and sage risotto – I love the creamy texture, and I add chilli for a touch of kick. It’s going to be better than ever soon because at last we have some successful squashes in the garden approaching readiness. Oh lovely. Thats one of my favourites too. We didn’t get our garden in order early enough this year to plant squashes, so I’m super envious. Homegrown usually so much better. Oh yes, that does sound good. I make stuffed peppers occasionally, but I’ve not tried them with chickpeas – yet! What a fabulous name. I’m dreaming of super puffy pancakes now. I particularly like the idea of your sweet potato & red pepper soup. I bet the colour is glorious. Yes, risotto is incredibly versatile and you’ve reminded me I haven’t made any in far too long. Dhal is probably my all time favourite. So easy, so delicious and so comforting. I love cashew nut based vegan cheesecakes with blueberry topping – yum! I have yet to try making a vegan cheesecake, but I absolutely must get around to it. They always look so good. A bright orange soup is always a winner with me. My favourite vegan recipe is macaroni cheese as it was my favourite meal when I was a vegetarian, although I’ve tried so many and still searching for the one that blows me away! Ah yes, macaroni cheese. It’s perfect comfort food. Good luck with your search. Baked potatoes are fantastic. Simple and so delicious. Spaghetti Carbonara without the ham/bacon! I know, but I add some Curry powder and some herbs as well as what I can chop that would go well and is in my fridge, all tastes divine!! That does sound interesting Ruth, a curried carbonara. , it is absolutely declicious! Ooh that sounds good. I can’t get enough of pesto at the moment and pea pests sounds ace. Mushrooms are just fabulous. I’ve not tried roasting them with peppers though. Vegetable casserole with Indian spices. I love spicy food. You’ve come to the right place then Susan. You’ll find many of my savoury recipes are spiced ones. Chickpea and spinach curry with broccoli rice – tastes so good! Ooh, I like the idea of broccoli rice Emma. I love making vegetable pilaf which is packed with the veggies that i grow on my allotment. Mmmm, nothing better than just picked homegrown veg. I made some fab vegan browines, they were gorgeous! I loved it because they were chocolate brownies. My favourite vegan recipe has to be vegan chocolate cake honestly i’m addicted to eating it as it tastes so good! Hahaha, that’s cheating Adenine. Who doesn’t love chocolate cake? I love a vegetable tagine with couscous. So delicious and filling and always brings back great memories. Yes, I too have good memories of a vegetable tagine with couscous. Keep meaning to make my own. This has been on my list to try for ages. It sounds delicious. Oh you’re missing a treat. Vegan dishes can be absolutely delicious Keri. Smoked tofu seems to crisp up much more easily than the classic variety. Tastes good too. That sounds like my kind of meal Melissa. All of those are firm favourites. My favourite recipe is Mushroom Surprise Pies, which always have mushrooms, soy sauce and chilli in them but can contain a wide variety of other ingredients (rice, vegetables, quinoa etc) depending on what I have in the cupboard. What a fabulous way of naming a recipe you’re never quite sure how it’s going to turn out. Sounds delicious. Vegetable curry because I can adjust the ingredients to whatever is in season and make a hot and tasty dish! These sound delicious. Anything homegrown gets extra brownie points from me 😉 Adore crispy fried onions too. I love Thai style hot and sour soup with seitan or marinated tofu – or anything with lentils in. I don’t think I’ve ever had Thai style soup before. I think that needs to be remedied. Falafel is always a winner. Must try it with beetroot hummus some time. These look amazing! I’d love to own a vegan cookbook so I can impress my mum when she comes for dinner! That looks amazing Choclette. I love a good sandwich and know I would love this one. Thanks for linking to me. Sharing! Yes, you are the queen of sandwiches Jac. Yours always looks mouthwatering. I love Chana Dahl because Indian food is my favourite and so much of it happens to be vegan. Win win. Yes a lot of Asian food is just brilliant for being naturally vegan and so tasty too. I suspect most of us stick to the tried and tested, which is why it’s good to have books like this to get us out of our comfort zone and give us alternative ideas. I am progressing from vegetarian to vegan and this book would help a lot! Well done Jill. It’s quite a big step to take. Ooh, that sounds scrumptious. Will have to give it a whirl. Thick, spicy stew with loads of root veg, pulses and pearl barley – and of course dumplings! Mine is a vegetable stir fry 🙂 because I can vary it depending on what I have in the fridge and it’s so easy to throw together! Mary Berry’s spaghetti with courgette, chilli and sun dried tomatoes. Absolutely delicious. I love Thug Kitchen’s Lemony Lentil Soup recipe – warming, filling but super easy and tasty. As the only vegan in my house, these recipes look amazing for helping my friends and family reduce their meat intake and maybe even convert!!! mushroom quinoa burgers are the best they taste amazing! I love Chickpea curry . I don’t think I’ve tried caponata. It sounds delicious. I use chickpeas a lot in stews and curries and chickpea with mushrooms, tomatoes and spinach is my favourite. My friend made a vegan lasagne which was absolutely delicious, thoroughly enjoyed it. Now that sounds gorgeous. My sort of food. Myself and one of my daughters are long-term vegetarians, myself for 30 years and my daughter for 10. My husband and other daughter regularly enjoy vegetarian main courses with us. My daughter and I have recently become vegan, and are newly discovering delicious and nutritious meals. Our current favourite is grilled pumpkin & black bean burgers, served on vegan rolls, and filled with delicious toppings such as roasted tomato, lettuce and dill pickle (kosher as this is vegan). We love it, as it is a quick and easy meal to make at the weekend, and is the perfect relaxed t.v meal for a Saturday movie night. That’s fantastic Deborah. You’re obviously an excellent and persuasive cook. Curried Coconut Quinoa and Greens with Roasted Cauliflower. Delicious and so full of flavor! The coconut milk in the quinoa is divine. I like to eat vegan sandwiches as a snack with humous, brown bread, red onion, tomatoes and cucumbers. It’ a delicious, healthy snack! I love no-meat mince n tatties! I make red lentils with peas, carrots and mushrooms and make either sweet potato mash or white potato and parsnip mash! We love vegetable curries with rice, vegetable chilli with lentils instead of mince and stir fry with tofu. All of these are part of our usual meal plans so we are eating meat free on many occasions which is healthier and cheaper but not lacking in taste. I like to make a vegetable and tofu stir fry with spring onions, chinese leaf and whatever other vegetables are to hand. I often used dried tofu whuch I rehydrate with boiling water and some soy sauce. It has a really chewy texture which you don’t get from many vegan foods. I make vegetable stir fry and just mix up the veggies we use every time and lots and lots of garlic and soy!